Most film fans probably have a small list of films that they just wish some enterprising distributor would track down and release on DVD. 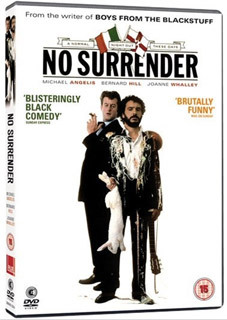 High up on our list for a good many years and unavailable on any format (or any TV channel) is No Surrender, a superb comedy drama that was the first feature film penned by Alan Bleasdale following his TV success with Boys From the Blackstuff and Scully. The film takes place at The Charleston in Liverpool, a seedy nightclub run by the local gangland boss. The new manager has arrived and his predecessor, a practical joker, has left a host of atrocious cabaret acts for the New Year's Eve bash. A band that can't play, a magician with a dead rabbit and, to top off the night, two coach parties of rival OAPs arrive, one devout Catholic social club complete with a drunken blind ex-boxer, and an equally boisterous group of Protestant revelers. When they get together mayhem ensues. The film re-unites fellow Blackstuff stars Michael Angelis (The Liver Birds, Bleasdale's GBH, the voice of Thomas The Tank Engine), Bernard Hill (Titanic, The Lord Of The Rings), and James Ellis (Z-Cars), who star alongside Joanne Whalley (44 Inch Chest, The Singing Detective) and the late Ray MacNally (My Left Foot, Empire State). No Surrender will be released on UK DVD on 25th July 2011 by Second Sight at the RRP of £15.99. Interviews with director Peter Smith and producer Mamoun Hassan.